HE Ambassador Mohammed Jawad Al-Doreky stressed the importance of these elections, as second cycle after the dictatorship, especially that the government to be formed will be the first one to rule the country after the withdrawal of the foreign military forces. He thanked Members who commended the large participation of Iraqis to vote. He stressed the efforts made for a good organisation of the elections, mentioning that IHEC members were chosen by the parliament and that United Nations Assistance Mission for Iraq (UNAMI) supported them continuously. He stressed that the elections were under the scrutiny of a large number of monitors and observers, national and international. He acknowledged that frauds might exist, but stressed that if there are accusations of fraud they should be brought to the attention of the IHEC (further step, to Court). He underlined that accepting allegations from people nonidentifiable or writing articles on that matter will not help solving the problem but could bring a lot of damage to the Iraqi - EU relation. In context, he stressed that in Iraq the People's Mujahedin of Iran (PMOI) is considered a terrorist organization. For clarifying the position of the Members of the Delegation, he asked for a statement to be issued in which to be specified that the Delegation is not taking sides and is waiting for the results of the elections and for the report of EU monitors. Mr Stevenson replied stressing that his aspirations are to support all Iraqis in seeking free, democratic, open society, including the end of insurgency. He underlined that he has not been hijacked by any political party or entity in Iraq, that he is not supporting a particular party; he is not biast in any way and looks forward to work with any new government in Iraq. He stressed also the importance for an emerging democracy to handle the allegations of fraud in elections, and that that could be handled by the IHEC. On Sunday Interpol issued a warrant for the arrest of former Iraqi leader Saddam Hussein’s daughter Raghad Saddam Hussein on charges of financing terrorist acts, which threaten the lives of innocent people, CNN reports. Raghad Hussein lives with her five children in the Jordanian capital, Amman. In 2006 she and her mother were put on Interpol’s wanted list on charges of abetting and financing terrorism. Raghad Hussein organized legal defense for her father, Saddam Hussein, was executed in December 2006. As newspapers reported the arrest of seven CIA operatives in Iran accused of planning to incite unrest and violence on a march scheduled for February 11, a cross-party group in the European Parliament held a meeting on Wednesday 4 February which clarified their own position toward the Iranian government and Iran’s peaceful opposition movement. The MEPs held their meeting with members of the Mojahedin-e Khalq (MKO) terrorist group. The MKO spokesman Abolghassem Rezai revealed that the “Friends of a Free Iran Committee” interpret the Iranian people’s ongoing peaceful public protests as a demand for regime change. This is of course in line with MKO, neoconservative and Zionist ideology. The group concluded that the way to achieve this regime change is to promote the MKO. The MKO has already deployed some of its trained militants into Iran since last summer in order to provoke violence and disorder and carry out assassinations. Some of these individuals have been arrested and charged, along with others, with incitement to violence or actual acts of violence during the peaceful protests. The MKO have advertised this as evidence that they ‘led’ the protests and that they have popular backing inside Iran. By promoting the MKO and introducing it as a tool to stage-manage regime change in Iran the European Parliament is in effect demanding ‘on behalf of the Iranian people’ that violence be introduced into their peaceful demonstrations to engineer – again on their behalf – regime change through the violent overthrow of the whole Iranian governmental system. Abolghassem Rezai has been identified by many inmates of Abu Ghraib prison as one of the MKO’s leaders who worked with Saddam Hussein’s Mokhaberat and who was actively involved in the torture of prisoners there. 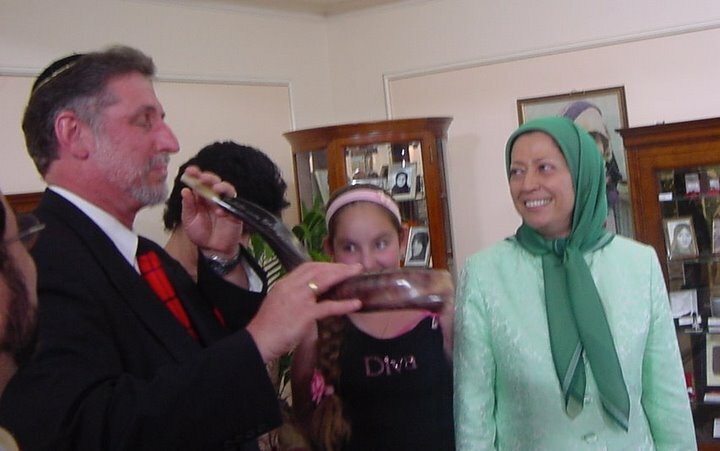 He is now regularly invited to the European Parliament as the go-between of Rajavi (the head of the terrorist organisation) and the Zionist backed MEPs in Brussels. 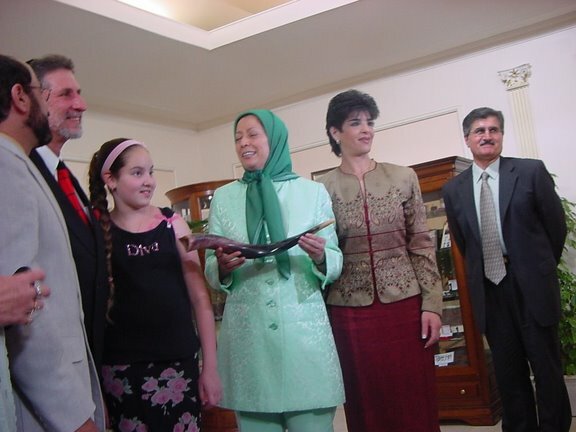 Rezai escaped to Europe with Massoud Rajavi’s wife from Camp Ashraf in 2003 shortly before Operation Iraq Freedom. MUTHANNA / Aswat al-Iraq: The Debaathification (Accountability & Justice) Department in al-Muthanna province would never allow any Baathists to run in the forthcoming elections, the department chief said on Friday, revealing that 14 Baathists managed to run in the past provincial council elections in Muthanna. “Names of candidates in the coming parliamentary elections would be neatly verified so as to guarantee that Baathists’ candidature would not be repeated like the case with the past provincial elections,” Mohammed Ismail Shibr told Aswat al-Iraq news agency. The Muthanna chief Baathifier pointed out that the Iraqi constitution has openly banned any Baathists, or members of the former Iraqi President Saddam Hussein regime’s Baath Party, from practicing any political activities in Iraq. The Debaathification Department had been set up after the fall of Saddam’s regime in 2003 under Ahmed Chalabi. The name was later changed to be the Accountability & Justice Department as part of Iraqi Prime Minister Nouri al-Maliki’s national reconciliation initiative in 2006. Iraqi state television on Sunday broadcast the confessions of three men said to have plotted two massive bombings in Baghdad on October 25 that left more than 150 people dead and hundreds wounded. The men are members of the Baath party, the outlawed political movement of ousted dictator Saddam Hussein, which the government holds responsible for mounting deadly attacks throughout the country, officials said. Major General Qassim Atta, spokesman for the Iraqi army's Baghdad division, said the men confessed to a judge that they orchestrated the bombings at the justice ministry and the capital's local government headquarters. Two of the three men had been officers in Saddam's army and in recordings shown to reporters they said a Saudi national assisted them as they drove three cars from Taji, 25 kilometres (15 miles) north of Baghdad. The cars contained explosives that were transferred days later to the truck and minibus that were used in the attacks, according to the broadcast. The plotters also confessed they had scouted the area of the justice ministry and Baghdad governorate building, taking pictures of the targets in the days leading up to the bombings. Iraq has arrested 73 people suspected of playing a direct role in two massive bombs that killed more than 150 people in Baghdad on October 25, Prime Minister Nuri al-Maliki said on Tuesday. They are suspected of working on the orders of the outlawed Baath party of executed dictator Saddam Hussein, and included members of Al-Qaeda, Maliki told reporters in Baghdad. He said he had personally scrutinised transcripts of interviews with those arrested in connection with the attacks at the justice ministry and the Baghdad provincial government headquarters, and referred to the questions asked. "Why did you choose the justice ministry?" Maliki said, recalling one of the transcripts he had consulted, to which the suspect replied: "Because it has a lot of glass and would maximise the number of victims." "Who ordered you to do this," Maliki continued, saying the suspect answered: "The Baath party," according to the transcript. The attacks, which also left 500 people wounded, punctured confidence in Iraq's security forces and led to the arrests of more than 60 soldiers and police, including 13 officers, for negligence. Maliki, whose political strength as premier has been built on security gains and being able to lessen the country's violent death toll, said the October 25 toll included 30 children killed at two nurseries for justice ministry workers. Colonel Khalil Ibrahim, chief of security for the justice ministry, told AFP in the wake of the attacks that 46 children had been in two ground floor nurseries at the time of the bombings. KUALA LUMPUR: The Immigration Department has confirmed that a wanted Iraqi former MP was detained at the Kuala Lumpur International Airport (KLIA) here last Saturday evening. Director-general Datuk Abdul Rahman Othman said Mohammed al-Daini was arrested for using a fake passport. “The immigration officer at the departure checkpoint stopped him after checks revealed that the passport he had belonged to someone else,” Abdul Rahman said when contacted yesterday. However, it is learnt he entered Malaysia on Oct 8 with a British passport. Mohammed is now under detention at the Immigration depot in Subang, awaiting deportation. AN AFP report said Mohammed had gone into hiding for eight months after being accused of ordering a 2007 bomb attack in the Iraqi parliament’s canteen. Mohammed had fled to Syria, before he left for Egypt and then Malaysia, according to Modhi Awad, brother of Mohammed Awad, an MP killed in the April 2007 bombing. The bomb attack killed eight people, including Awad. On February 25, Iraqi authorities prevented Mohammed from flying to Jordan but he was not arrested as he still had parliamentary immunity. Later that same day, parliament voted to lift his immunity, by which time the MP had fled. Just days earlier, reporters were shown confessions, which was aired on television, by a nephew and a security guard of the accused MP who said they had carried out several attacks for Mohammed including the parliament bombing. Asharq Al-Awsat newspaper published a long report on the situation of the combatants of the Mojahedin-e Khalq at Camp Ashraf. The paper said that about three thousand men live at Camp Ashraf, called Camp New Iraq by the Iraqi authorities, and over 70% of them are over fifty years old. It is not clear what can be done with them. Whether to keep them in Iraq, or send them to Egypt for example, or have the Americans give more protection so they can be used to threaten Iran. The only achievement of the MKO leaders in the past twenty years has been to have the name of the organization struck from the terrorism lists of many countries, a move which allows Iran to accuse them of hypocrisy. The paper reported that several families have travelled from far away just to get news of their relatives inside the camp. The Mojahedin-e Khalq claim they are officers of the Iranian Intelligence service who have been sent to conduct phsychological warfare on the group. 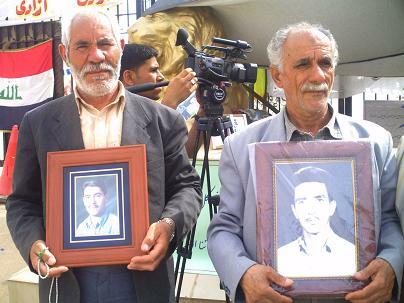 But Asharq Al-Awsat spoke to the families and to Nejat Society in Iran which is helping them, and they say all they want to know is if their relatives are alive and well or if they are dead. The families are holding a vigil in front of the camp where they have been situated for some months. Asharq Al-Awsat spoke to people who have recently escaped from the camp. They spoke of the terrible conditions there, and said that anyone wanting to leave was severely punished, even tortured. One former member of the MKO who has served in prison in Iran for terrorist acts while with the MKO told the paper that if the people inside the camp were free to choose, most of them would leave. The group is supported by America and is being used to pressure Iran. But, he says, Iran does not think the group is important and does not see any threat from them. An Iranian journalist said he believes that America, Iran and Iraq want to keep the MKO holed up in Camp Ashraf for different reasons, but that this is inhumane because the people inside are living in extremely bad conditions and their humanitarian needs should be cared for. The MKO leaders, for their part, accuse the families of psychological warfare and are demanding that the United Nations take over responsibility for the camp from the Government of Iraq. New Iraq has inherited a heavy legacy from the former dictatorship, which not only suppressed and crushed the Iraqi people and made hundreds of mass graves, launched wars and invasions, but left on the ground in Iraq a camp inhabited by a group of terrorists, mercenaries, who make up the military wing of the MKO terrorists who were allied with the former regime and participated with his security forces in the brutal suppression and liquidation of Iraqis, Arabs and Kurds, during the popular uprising in 1991 after the failure of Saddam's invasion of Kuwait, and other events. The Iraqi people are familiar with the strong relationship that linked the organization with elements of the former regime and the coalition between them and the fateful military support and material submitted to it by the former system and they will never forget the blood of Iraqi children that has been lost at the hands of these terrorists, and now [the Iraqi people] insist on their right to bring them to trial and justice. This organization has not only committed numerous crimes against Iraqis under the former regime, but persists in blatantly interfering in the internal affairs of Iraq, this time allied with sectarian terrorist organizations in Diyala province, where, in order to raise sectarian war in Iraq, the camp is kept intact. The Iraqi government of national unity, under its obligation to protect the sovereignty, security and stability of Iraq and to preserve its national unity and territorial integrity and establish the best relations with neighbouring countries on the basis of respect for sovereignty and non-interference and mutual interest and commitment to respect, will apply the constitution, in which Article «7 - II» states that the State is committed to fighting terrorism in all its forms and to work to protect its territory from being a base or pathway or field for terrorist activities. 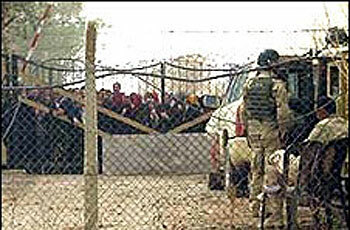 The terrorist organization and its members living in the Camp of New Iraq – formerly Camp Ashraf – have the choice only to return voluntarily to their own country or to choose another country to go to, especially as more than a thousand of them hold foreign passports or have the right to reside in various other countries. In preparation for this, the group will be under the supervision of the International Committee of the Red Cross and the United Nations and other international actors, taking into account the principles of human rights, for their transfer to another place where they are safe and which is appropriate as preparation for their departure from the land of Iraq to their own country voluntarily or other countries which accept to receive them. It is better for those who weep for them to exercise pressure on their own countries to accept them as refugees or in any other capacity rather than demand from the Iraqi government to maintain the outlaws who have contributed to the bloodshed of Iraqis. And we are surprised that some, who speak of international law and standards, accept ignoring Iraq’s sovereignty by those who have come there [illegally] by insisting he wants to live where and when he wants to! Not to mention committing crimes against the population of his own country whenever he wishes to. And all those who wish to know the reality of what is happening within the [MKO’s terrorist] camp, to know about the violation of human rights as reported by Human Rights Watch, and about the heinous crimes and mysterious and bizarre social life there, this has been narrated by a few residents of the camp (on the website: www.iran-interlink. org), who managed to escape from the artificial hell which controls the fate of the residents who are under all kinds of psychological pressure and intimidation by the leaders and traffickers, who have the luxury of living in Europe. genuine human rights activists and especially Mr. Shaygan's family on his release. Film showing the violent reaction of Mojahedin-e Khalq to the families trying to visit their children who are being held captive inside the camp by the Rajavis. This report is a short, logical addition to the mountain of statements which the MEK have issued in recent days. It has been published to further apprise those interested in this issue of what has taken place. What was it that the MEK was after when they attacked the families? One basic fact shouts louder than all others and that is, that for 66 days the MEK leaders have refused all access to the victims inside the camp. The MEK leaders did not let the families see their children even for a minute. 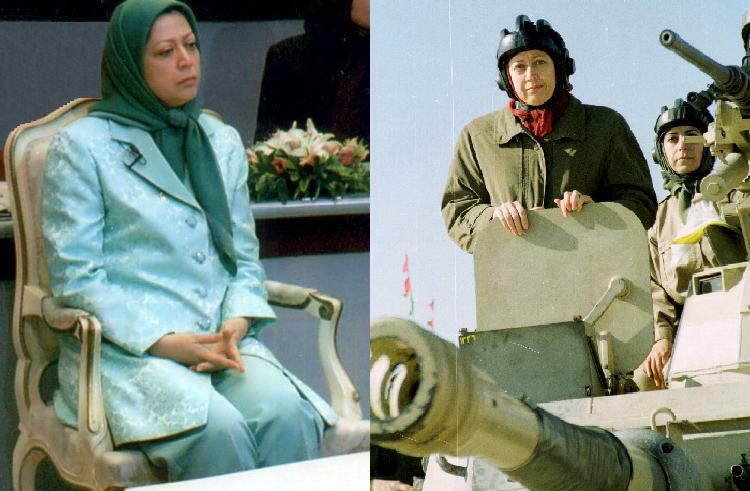 It is also clear that the MEK began the attack and that they had planned and coordinated it with all the MEK’s systems ready to play their parts, in particular the MEK’s relentless propaganda system – resulting in the mountain of statements. The families have been waiting for many weeks in front of the gates of the camp to see their children. The MEK leaders have obdurately refused them access. The families became so desperate to make contact that they started speaking over loud speakers so they would be noticed by the people inside. Their motivation has been to try to let their children know that they are there. From last week, the families decided to expose the activities of the MEK leaders by reading out loud the interviews of Ms. Batool Soltani (a former member of the Leadership Council). 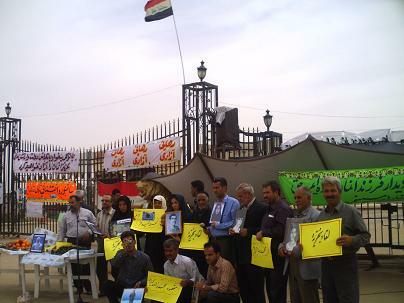 The MEK leaders objected and complained to the Iraqis that the families are insulting them over the loud speakers. As evidence they referred to the Soltani interviews. The leader of the Iraqi security forces made enquiries with the families, who then submitted a copy of the Soltani interviews to him in Arabic. The MEK have opened a so-called hospital in front of the gates which they call “The Hospital No. 2”. Only the trusted leaders and members of the cult are allowed to go in and out of this place. Even so, the reading aloud of the Soltani interviews has had some effect on them, and some have been communicating with the families with their hands and with various other signals, and in this way have actually encouraged the families to continue and not to give up. In an inspired move, the families had the idea to broadcast the sound of laughter of a two year old child into the camp. The members have not heard such a voice for decades. It made some of them, who were allowed to be near the gate, smile. This was also noticed by the MEK leaders and has shaken them. Three days ago, Mr. Iman Yeganeh Khorasani from Mashad, after 22 years, drove his lorry (which he works with) up to the gates of the camp and handed himself over to the Iraqi security forces. He later came to visit the families. Iman told Iran-Interlink, “Just before the Norooz (New Year) holidays the leader of section one started insulting the families. I asked, ‘Why are you insulting the families’? He told me, ‘They have been sent by the Iranian regime’. I said, ‘Even if this was true, this would not give you reason to swear at these people. Would you swear at them even if my family was among them?' At that point I told them that I refuse to stay there". Iman continued, “They started to arrange a few brainwashing sessions for me, but when they realised that I still refused to stay, they pleaded with me, ‘Stay until the end of Norooz because you have given your word and you have to keep your promise". “A few days before Norooz they started to extract new promises from the members again to say that they would stay until next Norooz. I had no choice but to run away from the camp. But the problem is that the leaders do not allow anyone to go anywhere by themselves, or do anything by themselves, or even walk around in the camp". Since Iman’s escape, the Mojahedin no longer allow rank and file members to carry out any maintenance or service work. The leaders are now doing all the work. For example, the leaders of each section now sweep the outside pavements themselves at nights. 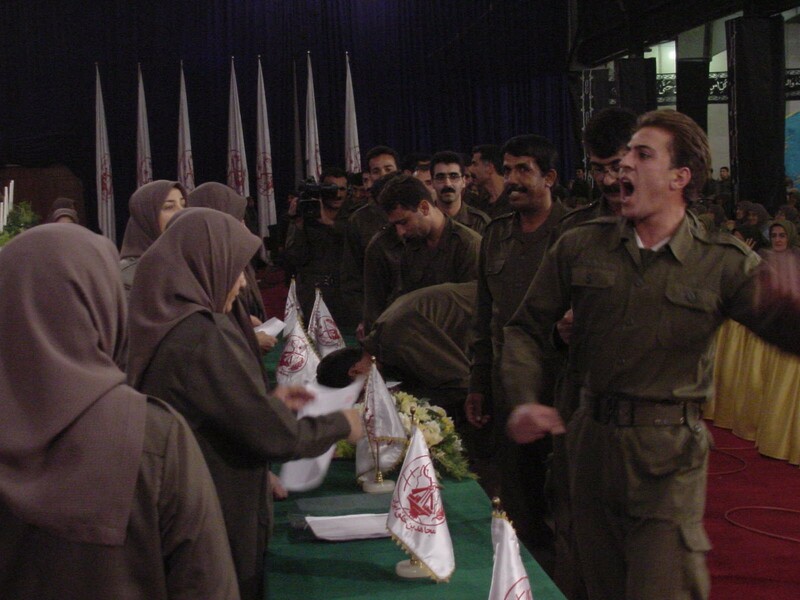 The MEK is facing a serious problem in keeping its members people under control. They are doing everything to stop them hearing the voices of the families, and to stop them from escaping. After Iman’s escape, the leaders increased the checkpoints inside the camp and have implemented restrictive laws to prevent people from escaping. The leaders now know that they can no longer control every disaffected person – and there are many, many of them in the camp. And they now know that the families have no intention of moving from the gates of the camp. It is this deadlock which forced the MEK to try to repeat the scenario of July 2009 and this time blame the families for the violence. On Thursday morning they started clandestinely placing loud speakers about 100 meters away from the camp gates. From about 10.30 pm that day, they brought together around 200 people who started swearing at the families using the very powerful loud speakers. They then began to try to incite the families who were behind the closed gates to respond with violence. Clearly, this kind of provocative attack aimed at the 11 family members outside the gate was intended to somehow engage the Iraqi security forces and provoke violence so that the MKO could cast itself in the role of victim – that is, 3500 people the victims of 11 families. At about 1.30 in the morning, the families, acting on the advice of the Iraqi security officers, retired to their makeshift beds. Without warning, two MEK women members appeared from out of nowhere with the intention of launching an attack on them with knives. Fortunately, they were intercepted by the Iraqis and were prevented from starting any violence or carrying out their assassination attempt. The MKO continued to swear at the families over their loud speakers until 3.00 am. 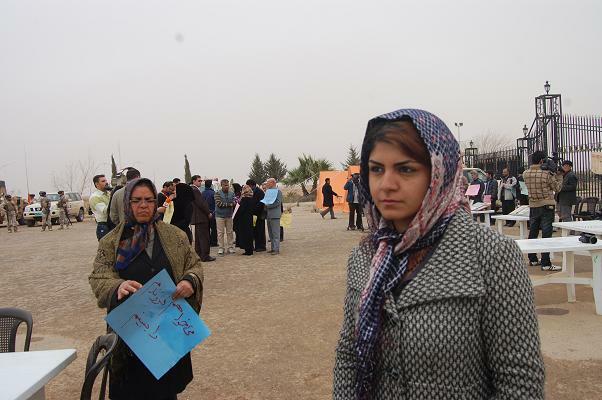 Then they broadcast an audio tape of the MEK military march ‘Victory’ on a loop, and threatened that they will do more and worse things to the families if they do not leave the gates of the camp. On Friday morning, the families again gathered at the camp gates with good moral. That night they hung coloured bulbs and lights all over the gate of the camp celebrating the “victory” of the MEK leaders the night before. 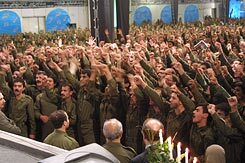 Their slogan, which they chanted that day, was, “You continue your war and victories and we will continue our persistence with singing and celebrating”. Of course, as expected, the MEK is claiming that the Iraqi forces and the families have attacked them. It is interesting that, while they continue to film every second, day and night, they have not presented a single clip of film to show this alleged attack. Iran-Interlink did, however, record some film that day, which will be broadcast in due course. This film will first be presented to the UN office, the Iraqi Judiciary and relevant human rights organisations. The knife wielding Mojahed woman has been identified and the families concerned are already in the process of submitting a law suit against her. 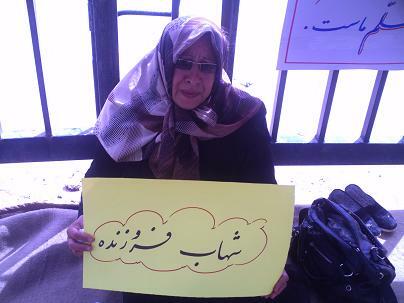 The families report that they are very happy to have news that Mojahedin leader Maryam Rajavi has been writing to the UN, so that someone there will be forced to take notice of their problems. They are waiting eagerly to see why it is that the UN does not take any action against the MEK’s hostage-taking terrorist leaders who are backed by some murderers in America and Israel. The families have a clear message for all: They will not leave without their children. They also warn that other families are also on their way. The families also wish to thank all the people, across the globe, who have given them support and encouragement. If Rajavi harms even a hair on my sister's head, America, you are responsible! Iraqi media and local dignitaries visit families outside Camp New Iraq (Ashraf) where Washington-backed terrorist group, Mojahedin-e Khalq are holding 3500 people hostage. Human Rights groups say Rajavi refuses to allow family visits in the camp. 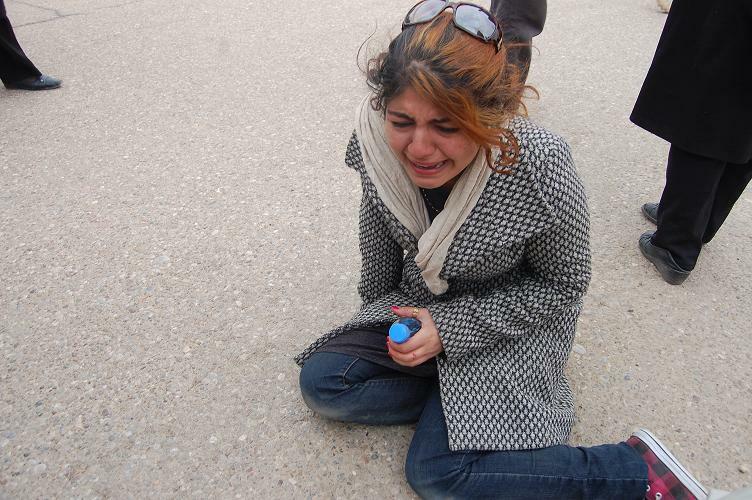 The video shows Hoorieh Mohammadi from Canada asking Americans and the MKO for compassion. Iran-Interlink.org has published a second report on Camp Ashraf, Iraq and the situation of Mojahedin-e Khalq (aka MKO, MEK) cult members at the camp. 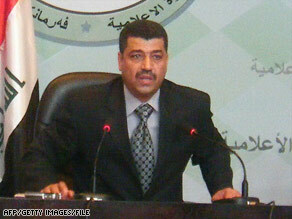 After consultation with the Government of Iraq, Massoud Khodabandeh has described events since January 1, 2009. 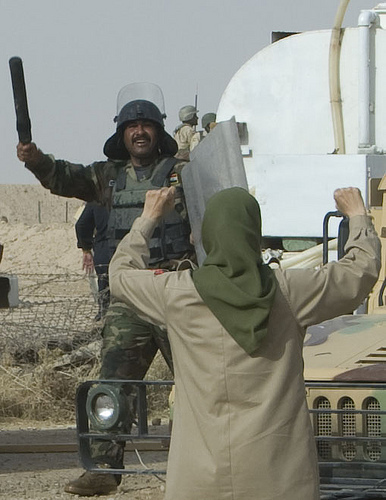 According to the report, Iraq is determined to rid itself of the foreign terrorist cult led by Massoud and Maryam Rajavi as soon as possible, but is hampered by western intransigence over where these people should go. 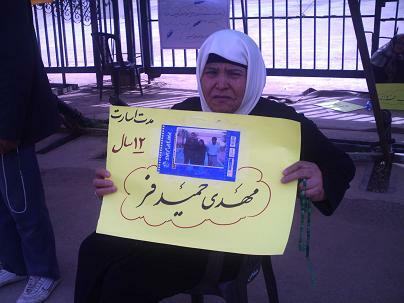 The 3416 individuals inside Camp Ashraf have no legal status in Iraq. They are not entitled to 'protected persons' status under the Fourth Geneva Convention. Neither will they be granted political refugee status by Iraq. Nor will Iraq forcibly repatriate them. But, although the MKO has been de-proscribed, at its own behest, as a terrorist group in Europe, no western country is willing to offer asylum to the individuals -- even though 1015 MKO members have a passport or residence permit of a third country. After months of fruitless negotiations with MKO leaders -- with U.S. observation -- a police post was established inside Camp Ashraf at the end of July. In spite of violent resistance by the MKO which led to 11 deaths, the camp residents are now subject to Iraqi law. Following evidence that MKO leaders were committing widespread and systematic human rights abuses inside the camp, the Iraqi Human Rights Ministry, in conjunction with international humanitarian agencies, is now set to properly monitor activity at the camp. Massoud Khodabandeh made several recommendations in his report. The Government of Iraq should remove around seventy MKO leaders in order to protect the rank and file members from human rights abuses and coercion. The camp must be thoroughly searched -- something the U.S. Army failed to do since 2003. Stressing that western governments bear a responsibility toward the MKO's victims trapped inside Camp Ashraf, Mr. Khodabandeh says that western politicians must prevent further political abuse of MKO members by the Rajavi leadership and guarantee the rights of those individuals who renounce violence and are willing to return to society. European governments should work with Iraq and the UN to find third countries to which other individuals in Camp Ashraf can be transferred. Khodabandeh said the Mojahedin-e Khalq (aka MKO, MEK, NCRI, PMOI, Rajavi cult) is broadcasting incitement to violence from London through its satellite programme Sima-ye Azadi . The group is also known to be financed through British based banks. “Britain, following Washington’s lead, has put herself in a position where she is seen to support terrorism. This is not in our interests.” said Khodabandeh. Hardliners in the Iranian government yesterday imposed zero tolerance on street protests after it was found that members of the terrorist Mojahedin-e Khalq cult had been dispatched to Iran to foment violence among the ordinary protestors. In August 2009, Massoud Khodabandeh published a second report following consultation with the Iraqi government on plans to expel the cult from Iraq. An Iraqi government official stressed that terror teams could not have been sent from Camp Ashraf after American forces handed over control of the terrorist base to Iraq in January 2009. Although the MKO remains on the U.S. terrorism list , the group operates freely from bases in Paris, London and Germany where the terrorist group’s members are “fully trained in terrorism and are ideologically committed to the violent overthrow of the Iranian government”. Massoud Khodabandeh is the director of Middle East Strategy Consultants Ltd which also operates the information website www.Iran-Interlink.org . Mr Khodabandeh has been involved in Middle East politics for over thirty years and is a leading expert on the Mojahedin-e Khalq organisation. Since 2008 he has acted as consultant to the Government of Iraq on plans to expel foreign terrorist groups. Alongside your government, we applaud those ordinary Iranian citizens who are determined to exercise their right to have their voices heard. As your government says, “they are showing great courage”. The UN high commissioner for human rights, Navi Pillay, has stressed that people had the right to protest peacefully without being beaten and jailed. We agree. It is a shame therefore that the Iranian people’s courageous, peaceful demonstrations to achieve their natural freedoms and rights are being fatally undermined from within the U.K.. The people of Iran deserve to be supported in their own efforts, on their own terms and should not be expected to shoulder the burden and pay the price of other agendas. Yet this is exactly what has happened over the past few days, weeks and even months. Clearly the essential problem your government has with Iran is over the nuclear issue. Should your government come to some agreement or should the US government accept a deal with Iran, would your government really be any more interested in the right of the Iranian people to protest freely against their government than you are currently interested in the rights of people in Saudi Arabia, Jordan, Egypt, Libya, … . In this context, regime change would be a desirable outcome of the unrest inside Iran. But even if we accept that you, the US and the Israeli governments have the right, in your own interests, to work towards changing the government of another country, surely regime change (to establish a government which would accept the terms of US administration on the nuclear issue) must not be pursued through the use of terrorism or terrorist groups. Today, Iran’s Interior Ministry has ordered a complete crackdown - zero tolerance - on street protests on the grounds that the disturbances are being led by foreign interference (British, U.S., and Zionism) acted out by the Washington backed Mojahedin-e Khalq terrorist group. Unfortunately the Iranian government’s excuse for this appalling situation has come from within the U.K. itself. The hardliners in Iran have demonised Britain by broadcasting together clips from the BBC Persian Service and the terrorist group Mojahedin-e Khalq’s satellite programme Sima-ye Azadi. The link? Both are broadcast from London. Both are financed through banks in London. In recent days Sima-ye Azadi, as broadcast from London, has been incessantly inciting ordinary people to commit violence during the recent protests in Iran. The programme urges people to arm themselves with firearms and other weapons and to target government personnel and facilities. Iran’s security forces have arrested several individuals who claim to be MKO members who have been sent to Iran in order to incite violent resistance during anti-government protests. This includes the alleged assassination of Seyyed Ali Moussavi, nephew of former presidential candidate Mir Hussein Moussavi by MKO operatives. Interestingly, a source in the office of Iraq’s Prime Minister, Nouri Al Maliki, has confirmed that it would have been impossible for any MKO member to have been dispatched to Iran from Camp Ashraf in Iraq since the Government of Iraq took control of the camp in January 2009. However, the MKO’s members who live freely in Europe are fully trained in terrorism and are ideologically committed to the violent overthrow of the Iranian government. It is therefore most probable that these teams have been dispatched from here. Your government has criticized the violent crackdown on anti-government protesters. Unfortunately, your government has not made clear its position on the use of terrorist tactics during these protests. We cannot ask a terrorist group to renounce violence and give up terrorism. Instead we are asking your government to curb their activities in line with British law and with your government’s own stance on terrorism. The massive turnout to counter theprotest demonstrations and the severe government crackdown on anti-government street protests would not have been possible if it had not been for the involvement of the MKO. The severity of the response -reports suggest a turnout of over 3 million people in Tehran only - is not against the ordinary citizens of Iran but against a known terrorist group which has tried with western support to hijack the protest movement for a different agenda. Iranian government run media has broadcast telephone conversations from the MKO’s base in London, intercepted following the June election protests, in which an MKO leader is ordering terrorist acts in Tehran. Your government cannot have been unaware of this activity and yet has done nothing to prevent or prosecute those responsible under British law. Britain, following Washington’s lead, has put herself in a position where she is seen to support terrorism. This is not in our interests. The Mojahedin is known to Iranians inside and outside the country as a Washington/Zionist backed terrorist group. It is known worldwide as Saddam’s private army, responsible for the murder of tens of thousand of Iraqis, Iranian, Americans and Europeans. But, as you are aware, its media and financial support are based in London. We would expect that you act immediately to prevent the incitement to violence by the terrorist Mojahedin-e Khalq from inside the U.K.. In doing so you would remove from Iranian hardliners their main excuse for crushing the people’s legitimate protests to bring about change in their own country. I am sure your government has enough information on this situation, but if not, please feel free to contact me so that I can apprise you of these facts.